Despite the change in policy, some gardens maintained a more traditional appearance this year, such as the East Village display. 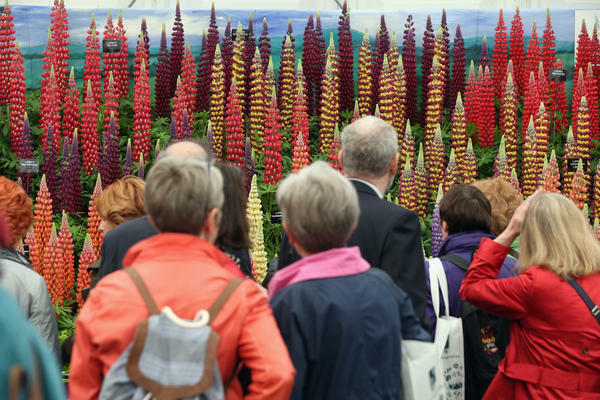 The prestigious gardening event allowed gnomes for the first time. 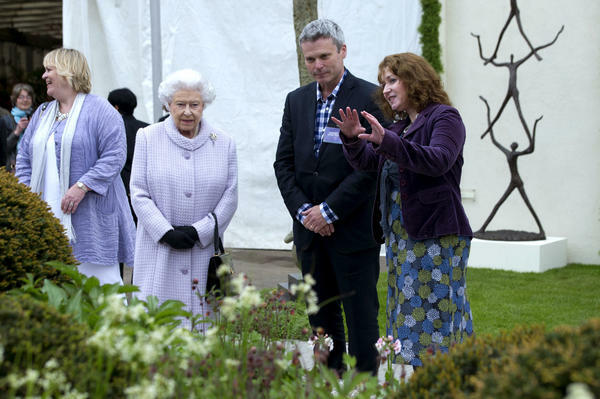 Queen Elizabeth II meets award-winning garden designers Patrick and Sarah Collins at their First Touch Garden. Less famous visitors take in a display in the Great Pavilion on Tuesday, the event's opening day. 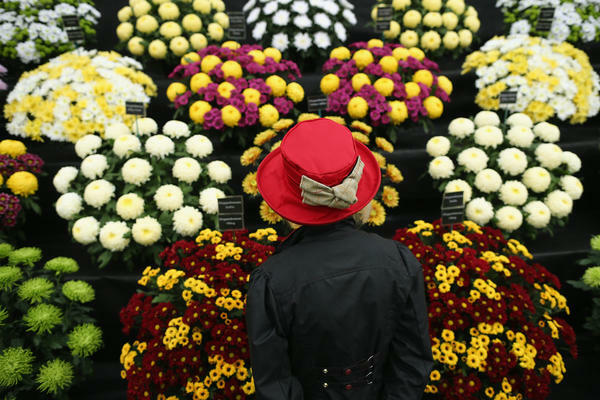 The Royal Horticultural Society had banned all "brightly coloured mythical creatures" from the Chelsea show. This show garden has plenty of wheelbarrows, but are there any gnomes?  The show is celebrating its 100th anniversary this year. 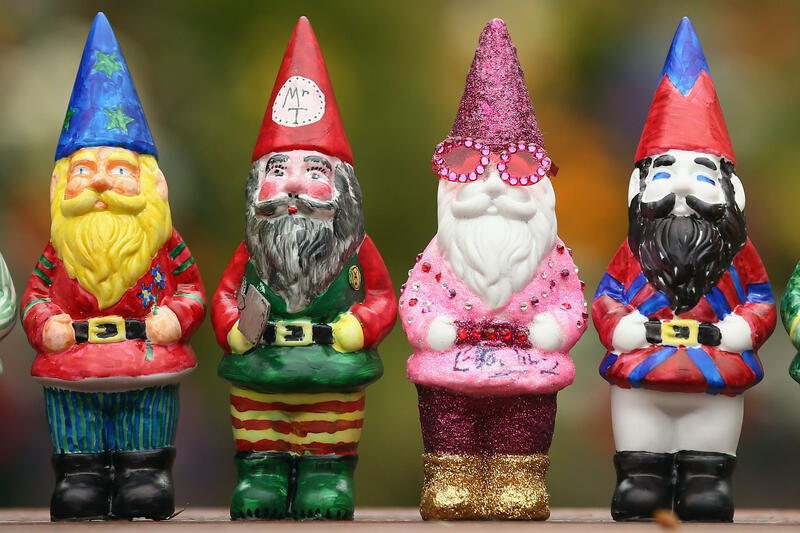 Decorated gnomes designed by celebrities, including Elton John (his gnome is second from the right), are featured at the Chelsea Flower Show in London on Monday. Decorated gnomes designed by celebrities, including Elton John (second from the right), are displayed at Chelsea Flower Show on Monday in London. 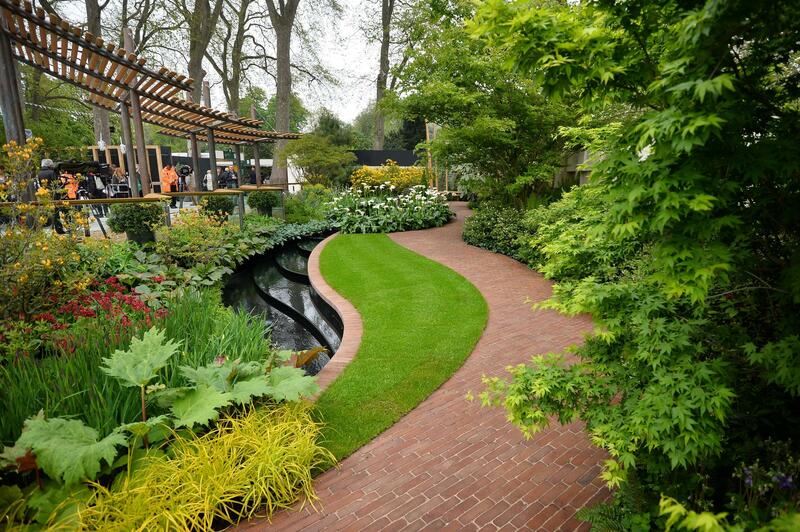 Gnomes marched their way into one of England's most prestigious gardening events this year. The 100th annual Chelsea Flower Show, which ends Saturday, opened its gates to the flower-friendly creatures for the first time. Gnomes decorated by celebrities made their debut at the show and are now up for auction on eBay to raise money for a campaign that encourages school gardening. The highest bid for the seedling gnome decorated by Elton John tops 2,000 pounds. The figurines are available until Sunday at midnight. "Alternately loved and loathed, the gnome epitomises the social divisiveness of garden design," garden historian Dr. Twigs Way wrote for the BBC. "Some exhibitors went proud and loud, putting gnomes in places they would not be missed, like in the middle of the grass. Others seemed to feel that gnomes may be fine for other people, but certainly not any people they know, or want to know. One renowned landscape architect, Robert Myers, hid a gnome in a tree in his display, lost his nerve and took it out again before the judges could see it." Way, author of Garden Gnomes: A History, tells NPR's Scott Simon that gnomes were brought to England from Germany, where it was believed that the "mythical folk" helped in the garden and on the farm. When they first arrived in England during the Victorian period, gnomes were all the rage — and expensive. "But the link with Germany, I'm afraid, was their undoing," she says, "because, of course, as soon as the first world war broke out, not only could you not get German gnomes anymore, but of course people didn't really want German gnomes anymore." Then, in the 1940s and '50s, garden gnomes were back in style. Way says the animated film Snow White and the Seven Dwarfs helped give them a boost. Whether to include gnomes in the Chelsea Flower Show has been under debate for some time, she says. "When the [Royal Horticultural Society] started having the show [in 1913], they put a blanket ban not just on gnomes, but on any colorful, mythical creature," Way says. 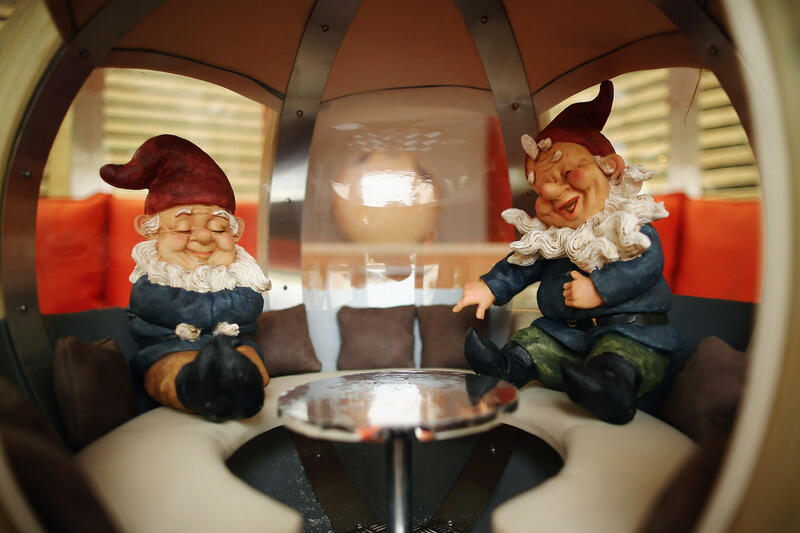 "For about the last decade or so, there's always been somebody that tries to sneak in a garden gnome because what they want to do, really, is say, 'Who is this garden show for? Is it for the suburban gardeners who may love their gnomes? Or is it just an exclusive show at the high end?' "
Now, to England where another hallowed tradition is under siege. This year, they are allowing garden gnomes at the annual Chelsea Flower Show. 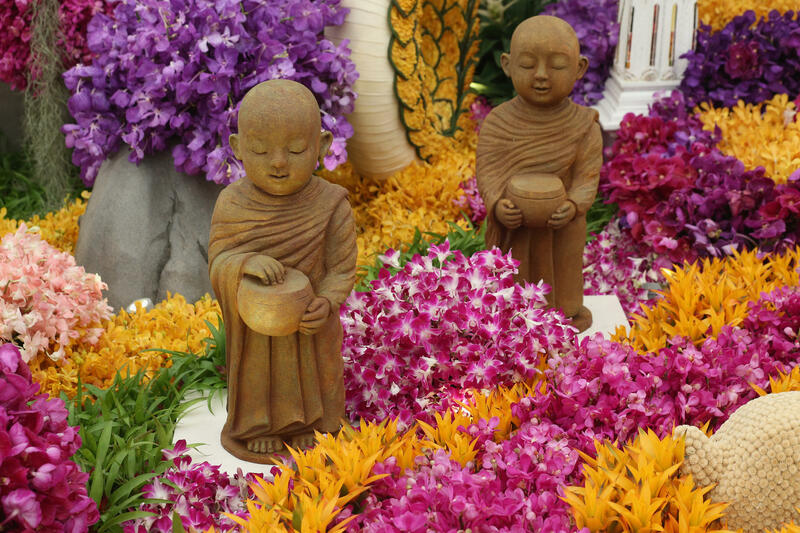 The little figures are being sold to raise money for a charity that encourages young people to garden. The gnomes are causing some to have their knickers in a twist. We're joined now by Dr. Twigs Way who's author of "Garden Gnomes: A History." Dr. Way joins us from our studios in London. Thanks so much for being with us. DR. TWIGS WAY: Hi, really nice to be here. SIMON: So why do these gnomes raise such a stir? 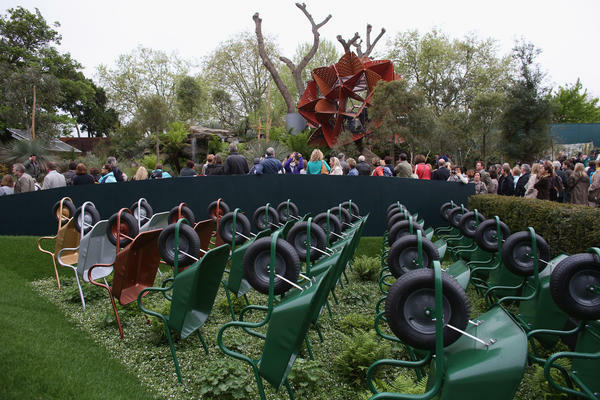 WAY: They're probably about the most contentious garden ornament that has ever appeared at Chelsea and the most contentious garden ornament really ever. If you put a garden gnome in your garden in England, the neighbors kind of get, oh no, you know, the neighborhood's going right downhill. SIMON: Dr. Way, I don't understand what garden gnomes are all about. Are they merely decorative? Did they begin as kind of like scarecrows? WAY: Historically they go back to the Victorian period. They were brought in from Germany, but they were seen by English people who were visiting places like the Black Forest and they saw these figures in gardens in Germany and they decided to bring them back to England. And originally they were very highly sought after, they were expensive, but the link with Germany, I'm afraid, was their undoing because, of course, as soon as the First World War broke out, not only could you not get German gnomes anymore, but of course people really didn't want German gnomes anymore. Coming into the sort of '40s and '50s, fashion is reborn for these kind of garden, little garden creatures particularly on the back of the animation "Snow White and the Seven Dwarves." SIMON: OK, I get that the British inherited garden gnomes from the German tradition. Why did the Germans have garden gnomes? WAY: They believed that little folk, the mythical folk, helped out in the garden and around the farm and in the mines. It was a mining area of Germany. SIMON: So what's the resistance with putting them into the show? WAY: When the RHS started having the show, they put a blanket ban, not just on gnomes, but on any colorful mythical creature. And it became a point of discussion, and so for about the last decade or so there's always been somebody that tries to sneak in a garden gnome because all they want to do really is say who is this garden show for? Is it for the suburban gardeners who may love their gnomes, or is it just an exclusive show at the high end. SIMON: Dr. Way, I'm going to assume you have a garden. WAY: I do, but I've only been in my present garden for the last nine weeks because we just moved house. JULIE MCCARTHY, BYLINE: Well, any gnomes? Not yet. I have yet to find the right gnome for me. SIMON: Garden historian Dr. Twigs Way.